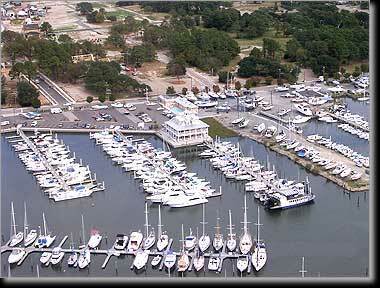 East Beach Marina is the redevelopment of an old marina on Pretty Lake Avenue in the East Ocean View area of Norfolk. Located on the north shore of Little Creek with direct access to the Chesapeake Bay, East Beach Marina includes 120 floating boat slips, the Blue Crab Restaurant, ships store and pool. With a sister marina next door, travelift facilities and fuel service are also available. Langley and McDonald served as Construction Manager. Tom Langley prepared a master plan of the boat slips to maximize the number of slips that range from 24' to 40'. He also represented the Owner to modify previously issued regulatory permits to fill a tidal canal for more usable upland and to create vegetated wetlands. Permits were also obtained to reconstruct a travelift facility. While the marina design was being completed, bids were received for demolition of old piers and pile clusters, and for dredging. The original dredging permit was based upon mechanically placing 2,500 cy on the upland for bulkhead backfill, and approximately 6,000 cy barged to Craney Island. This method was cost prohibitive, so Mr. Langley was able to modify the permits to allow hydraulic dredging with all material being placed on site. This saved $70,000 to the Owner's benefit. A new fiberglass bulkhead with a concrete cap was constructed, tied back to a continuous steel sheetpile deadman. The Blue Crab Restaurant and ships store was constructed on a point of land with water on two sides and the newly created wetlands on the third side. The East Beach Marina is the first, privately developed project spurred by the City of Norfolk's redevelopment efforts in East Ocean View.